Maybe you didn’t “do anything” to your competitor. Maybe your competitor is struggling and simply wants more customers. Maybe your competitor thinks your success online means less profit for him or her. I don’t know what your competitors think—and you probably don’t know, either. But I do know one thing: you don’t want your business, livelihood, and your family’s finances to depend on whether or not your competitors are ethical people. Just as people can hurt each other in real life, they can hurt each other where it really counts online: Google Places. Your competitors are probably honest people. But there are always the bad apples. Even the bad ones most likely can’t hurt you intentionally in Google Places right now—unless they’ve been studying up on it. Some people are clever and knowledgeable but also dishonest and unethical. 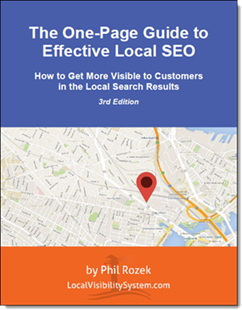 There are specific tactics they can use to deprive you of local customers in Google Places and take a chunk out of your business and profits. For any competitors to use any of these against you, they’d have to fall somewhere between savvy and ingeniously cunning. Some of these tactics I’ve seen used, whereas others I haven’t seen anyone use. But each one is a vulnerability that you should know about. Disclaimer: I can’t control who reads this, or what that person does with the info I provide. I’m telling you about these tactics so you can prevent them from being used against your business in the first place, and so you have an idea of how to counteract them in case you do encounter them. 9. They upload malicious or unflattering photos to your Places page. They don’t even have to be untrue or libelous; they could just be really ugly or irrelevant photos that turn customers off to you. Sure, you could get them removed, but it will be a real nuisance for you—and some potential customers will inevitably see the photos in the meantime. 8. They relentlessly use the “Report a problem” feature in Google Places to try to convince Google that you’re doing something wrong. 7. They pepper your Google reviews with flags and reports of being “inappropriate”—and then get their henchmen to do the same. If they succeed, your legitimate reviews might go the way of the dodo bird. 6. They could get several people to write you a bunch of positive reviews. Google may suspect you’re buying positive reviews (which some people do), and may pull your reviews or even suspend your account. Your competitors could take it a step further by making the reviews sound really fake (though still positive), which could cause legitimate people who visit your Places page to flag the reviews as “inappropriate” or “unhelpful” and get you into trouble. 5. They write nasty reviews of you on third-party sites and/or or on sites like PissedConsumer.com. These are especially tough to combat because (1) it’s harder for you to keep tabs on a bunch of different sites, because (2) one person can easily create a bunch of different user accounts on these sites and write you a nasty review on each, and because (3) some third-party sites don’t give you much recourse even if your business is getting slammed unjustly. 4. They write fake negative reviews, get their friends and family to do the same, and pay even more people to do it. They’d get a bunch of people to write not only negative Google reviews, but also nasty reviews on third-party sites. Most customers would know the reviews are cooked-up, but some would be convinced, and your Google Places ranking would most likely still take a hit. You could counteract their efforts if you took enough time away from running your business, but don’t expect Google to step in and do anything. 3. They set up fake Google Places listings for your address, using a different phone number from the one you use. Long story short, Google views your phone number as the unique “ID” of your business. If Google doesn’t have confidence that it knows what your real phone number is, your ranking will take a big hit. 2. Alternatively, they could set up fake Google Places listings using the name of your business but with a different phone number and a different address from the ones you use. Again, this would be an attempt to spread inconsistent info about your business and create “uncertainty” about your business in the eyes of Google. Having duplicate listings in general isn’t good for your Google Places ranking, and it’s far worse if there is a bunch of inconsistent information about your business floating around on the duplicate Places listings. The worst part is if your competitor lists an address that isn’t your real one, he potentially could receive the verification PIN from Google in the mail and actually “owner-verify” the fake listing. Google likely would eventually conclude that it isn’t the right address, but your competitor still will have thrown a wrench into the system. 1. Probably the worst thing a competitor could do to you is to use Tactic #2 against you and go to numerous third-party sites and create a bunch of fake listings for your business, all slightly different from each other. Not only does your Google ranking suffer when you have a ton of duplicate listings floating around cyberspace, but it’s infinitely worse when the info in those listings (phone numbers, addresses, name of business) is inconsistent. It would be extremely tough to manage the information that the most important third-party sites have about you—especially if an unethical competitor keeps peppering them with false info and maybe even claiming some of the listings. Especially if this tactic is used in combination with any of the others, you’ve got a serious problem on your hands. Watch your Google Places listing like a hawk. This means not only checking the Place page itself for anything suspicious or malicious, but also logging into the “Dashboard” area to make sure you don’t have any notifications/warnings from Google. Keep an eye on third-party listings and data providers—including Yelp, SuperPages, CitySearch, and ExpressUpdateUSA. Look out for duplicate listings and see if the info they contain is accurate. If not, get the duplicates removed. Set up Google Alerts for your business name and website name. Doing the same for your competitors’ names is a good measure, too. Read all your reviews—first and foremost on your Places page, but also occasionally on major third-party sites, like Yelp and InsiderPages. If you see a suspicious-looking review, click on the username of the person who wrote it. You’ll be able to see what other reviews that person has written. If there’s a scathing 1-star for you but a glowing 5-star for your competitor, you’ll have a pretty good idea of what’s going on. If prevention doesn’t work, contact the business owner. First just mention what is going on, and ask in a non-accusatory way whether they might know anything about it. If they’re dodgy, explain your reasons for thinking they’re up to something, and then ask them to explain what’s really going on. Obviously, be as polite as possible and don’t lead off with finger-pointing—but also be firm and keep your BS detector cranked up. Meanwhile (maybe before you even contact the business owner), use Google’s feeble but occasionally handy “Report a problem” feature to let the powers-that-be at Google Places know something’s awry. To a peaceful, fair, prosperous local market. Well done, Phil! As an aside: I recommend you start adding an author credit to these posts. That way folks like me know to whom to give credit. Hi Phil, thanks for the great post. I was wondering if you could give me a hand? My buddy owns a large real estate company and I am helping him get his google places/plus account up and running. I claimed it a while back but there were already a couple photos attached to his unclaimed account at the time. I went through the verification process and most of my updates are now live (except for the video for some reason) but these old pictures are still there. I contacted Google but to no avail… do you where I have to go to get these pics removed??? I know how you feel. The photos have been a real PIA as of late. In particular, the problem is that it just takes Google *forever* to process updates you make. 1. I assume you tried deleting the old photos from within your buddy’s Google Places dashboard? It sounds that way, but just wanted to double-check. 2. Have you determined that there aren’t any duplicate Google listings floating around for the company? It sounds like you *may* have a merged listing. If you post the link to your friend’s Google+Local page, I can take a super-quick look – and someone else reading this might be able to weigh in, too. At the same time or instead of doing that, you may also want to drop by Linda Buquet’s excellent Local Search Community Forum. Hmmm…I’m stumped. Do you have any idea whether the photos are of Royal LePage agents, or you just have no clue where they came from? I ask because I checked a few other Royal LePage listings, and none has those two photos that shouldn’t be there. If you know whom the photos are of, a little more gumshoeing may prevail yet. But if you’ve got no idea who’s in the photos, the next step would be to go to the “edit business details” link on the side of the Google+Local page and to request that Google remove the photos. I’d give the forum / “contact Google” route several attempts, a lot of time, and a superhuman amount of patience. I’d definitely stick with it unless and until the photos are removed by other means. I probably shouldn’t have been so unclear on one point: I was wondering if you know the names of those two Royal LePage agents. My thought was to check their G+L listings and see if the photos are there, so that then you could say to Google “Hey, umm, these photos on our listing belong on these other listings.” If you want to run with this approach, great. Or, if you want, you can email me the names of those agents (we’re getting a bit off-topic for the comments here). Awesome! It’s always nice when Google only takes days, rather than months, to fix stuff. As you can see someone has done something that has resulted in the business name being altered. It should simply be FUNKY FONES, but instead is showing as FUNKY PHONES DONT PAY THERE BILLS. Obviously someone trying to sabotage their reputation. From what I can see there is only one places listing for FUNKY FONES, but how can I be sure of this? Is there a particular search method you use to check? There have been some recent issues, the client is not very tech savvy and managed to let his domain and hosting renewal lapse which I have had to come in and sort out for him after the fact. Could this have had anything to do with it? To give you an idea of what I have done so far. I have used the REPORT A PROBLEM feature earlier this week. I have also logged in to the client account and used the FIX A PROBLEM troubleshooter (http://support.google.com/places/bin/static.py?hl=en&ts=1386120&page=ts.cs) and now I have linked their domain into Google’s Webmaster Tools, and used the FETCH AS GOOGLE option as there was a DNS crawl error. I am also aware that the client has a roughly 20 different business directory listings with outdated information, mainly their old address, which I am slowly working my way through sorting that out for them also. 1) How do you think this happened? 2) Is there anything else I should be doing to fix the problem? 3) How long is it likely to be before Google update with the changes? 4) Is there any way of preventing future sabotage? Wow – talk about crooked. That’s one for the ages. This might be a little too in-depth of an issue for the comments section here, but I think the solution may lie in making changes in Google MapMaker (google.com/mapmaker). That may have been where the changes were made in the first place (I haven’t gone through the MapMaker edits history, so I’m not sure). Also, you may want to post this over at Linda Buquet’s forum (http://bit.ly/15hNsXw), where I’m also active). There are a couple MapMaker experts over there, as well as people who might have ideas that I haven’t thought of.